Masks used on the cover were created by David Nader and generously donated to the author to use as part of the cover. "In Keepers Meet Questing Eyes, John Flynn provides us with a book of poems that explores the connections between the human and the natural world, between love and loss. This is a book that engages the reader and shows us the often hidden parts of ourselves and our lives. Truly, the poems in this book are a blessing." "I have sampled John's poems with pleasure." "John Michael Flynn speaks of real and recognizable characters. I recommend his work to all readers, not just so-called specialists in poetry." 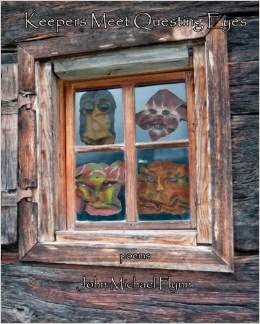 "I have for years enjoyed John Flynn's short stories, poems and translations." and Two, Two Lily-White Boys. "His poems are not 'absurdly modern' but take the risk of articulating a serious moral gaze." JOHN MICHAEL FLYNN has taught ESL and Composition at a variety of schools and colleges across the United States. A resident of central Virginia, he served in the Peace Corps in Moldova from 1993 to 1995. Previous poetry collections include Moments Between Cities (1997), and Washing Apples In Streams (2013). In 1998, he received the Erika Mumford Prize from the New England Poetry Club. Leaf Garden Press published his chapbook, States And Items in 2013. Find him on the web at www.basilrosa.com.